Training sessions invariably have participants that come from a wide array of backgrounds and have various talents and levels of expertise. Some will be outspoken and others more withdrawn. Some will already have a background in accessible design, while others may have never heard of web accessibility. Your participants will also have a wide range of technical expertise. You may have die-hard developers that program in text editors or an administrator who doesn't know what HTML stands for. It's important that you gain an understanding of what your training participants' talents and knowledge levels are, and then take advantage of their skills and abilities. Web accessibility trainers must be flexible in the content they present. At the beginning of my trainings, I almost always include a comment about working in 'pointy bracket land'. I can tell by peoples' responses what their technical expertise is. Pointy bracket land is referring to the "<" and ">" which are used in HTML. It's also a good idea to ask questions to see what people are interested in and what they want or expect to learn from your training. Then it's up to you to deliver. You need to be comfortable enough with your content to address what your audience needs. Sometimes all the training participants will be technically proficient, so you can spend less time covering some of the basic principles of web access and get to the content they want. At other times, the audience may be much less skilled in technology or HTML. This group can often provide basic insights and ideas to us technophiles that we otherwise probably wouldn't think about, but they will probably fall asleep or leave if you start throwing 'pointy brackets' at them. Finally, find ways to get the more skilled training participants to help with the training. Encourage them to interact with and help others. If they have experience in web accessibility, ask them to share their experiences. It is often this group of training participants that provides the rest of the group with information that will allow them to more effectively learn and apply the training content, especially after your training concludes. If you are providing handouts or resources, make sure you have accessible versions. These might include an electronic copy of all handouts on disk or on the web, or in Braille and large print versions of any paper resources. Are assistive technologies and services available? You may or may not be in control of your training set up and location, but when possible, ensure that assistive technologies are available to those who may need them. These might include screen readers, screen enlargers, assistive hardware, interpretive services, or captioning services. Are the web sites you plan on using or demonstrating, accessible? This may not always be the case. I often use inaccessible web sites to emphasize the importance of web accessibility and demonstrate what not to do. It's always good to have a list of inaccessible sites to demonstrate. On the other hand, when you are using online resources or tools, do your best to use the most accessible ones available. Is your presentation accessible? If you are using PowerPoint or other presentation software, make sure to provide audible descriptions of content on the screen. "As you can see on the screen..." does not apply to everyone. When demonstrating software, explain audibly what you are demonstrating and describe the function of things that are not readily apparent (i.e., "Select the OK button on the Save As dialog box to save your file" instead of simply "Click OK"). I have learned that training participants with disabilities can be very valuable assets in getting your point across to the other participants. They can provide insights and real-life experiences in a first-person setting that you, as a trainer, cannot provide. In one training, I was trying to explain what a refreshable Braille device is and couldn't come up with the words to best describe how the pins pop out to form readable Braille characters. At that moment, an individual in the training proudly stood up and showed everyone her portable note taker, which had a refreshable Braille output. She described how it worked and demonstrated how she likes to use it. The device was passed around so all could see and feel it. I know the other participants in the training gained a greater appreciation for the technology and her individual experience as a person with a disability because of that experience. 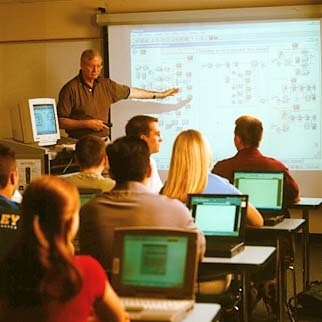 Learn the background and technical expertise of your training participants. Be willing and ready to adjust your content to address the needs of your audience. Encourage exceptional training participants to help with your training and to provide encouragement and support for other participants. Provide accessible versions of all applicable training resources. When possible, make sure assistive technologies and services are available. Develop and use accessible content yourself. Provide auditory descriptions of any visual content you are using, presenting, or demonstrating.